Recently I (Rebecca) attended an international phenomenology conference. At the conference, after a presentation that involved investigation and quotes from various illness blogs, the researchers began a dialogue about why illness bloggers chose to share such private details about their illness in such a public forum. It was interesting to watch the discussion, but also it was clear that the researchers were not bloggers nor people with critical illnesses. 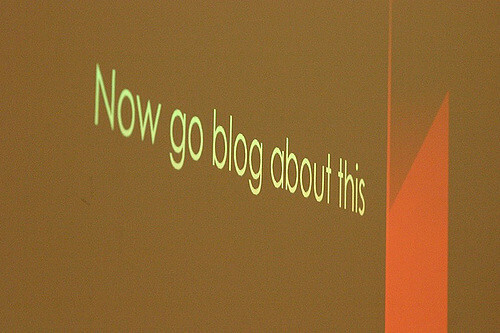 Their guesses as why illness bloggers share their stories demonstrated their lack of understanding of why we choose to blog. It was that discussion that inspired my blog post about Why we keep blogging and this conversation on Virtually Connection ePatients. We still have some empty spaces in the conversation. If you are interested in joining the conversation please leave a comment, tweet (#vcept tagging @vconnecting), or send an email to info@virtuallyconnecing.org. Have a suggestion for conversation topics related to ePatients? Please leave a comment or email them to Rebecca Hogue (rhogue@pobox.com) or Virtually Connecting (info@virtuallyconnecting.org). You can watch the conversation using the YouTube link below. Feature image used under creative commons license no attribution requested. I will join in… but will be in my car.